On Monday morning, most of the team met up in Oslo and we started our journey in our rented nine-seater van (which Alex nicknamed “The Slug”). We were heading up to the chilly mountains of Rauland, which is about 210 km west of Oslo. On our way to Rauland, we stopped at Heddal stavkirke. A church built completely out of wood! Five hours of driving through breathtaking terrain brought us to the beautiful Vierli Tourist Centre near Rauland. We met up with Pia and Emma S, signed in, then made our way up one of the many ski hills to our cabin. At the top we were greeted with an astounding view, a ring of large, snow-covered mountains surrounding an area of rolling hills, and a lake. The fashion for houses in this village and along the way seemed to be black wood paneling, red trim, and a grass roof. After admiring the view and a quick team meeting, we drove down to the Sauraai map. The terrain has several hills scattered with hard-to-read rock features. There is a lot of contour detail and plenty of marshes that go up the sides of hills. They are, however, very runnable. “The marshes are like highways.” Emma W. The key for this map is simplification to marshes and contours since the mapping of rock features is quite inconsistent. The day's training started off with an early strength session with the US juniors at a park near Isabel Bryant’s house (where all of us were staying). After a hearty breakfast and with sore abs, we all drove to Highlands Playground for the first of the training sessions. Unfortunately I was injured (something with my shin) so I was forced to walk all the sessions, at least I was able to focus completely on the technical aspect. The camp started off with a simple course to focus on the sprint fundamentals, which included looking up, folding the map before punching, and knowing the exit out of the control. This was the basis for the next four days. The next exercise was a snowstorm-O (everything except the control circles and lines blanked out). This was to practice distance estimation and making sure you exited the control in the proper direction, since you were only able to go on a bearing. The final session in this park was a maze-O, which focused on very quick route choice to get the best flow both to and through each control. It was really fun so we all did it many times and had a couple mini races. 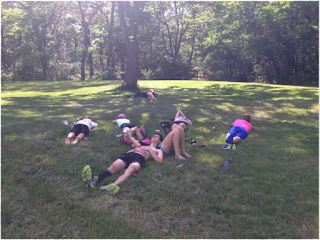 After a pizza lunch, we went to Edmands Park for some forest sprint training. First was a partner relocation exercise where one partner did three controls on their course, then the other partner did three controls on another course. I did it with Michael Laria, since he has a leg injury and was also walking most of the camp. Team cripple! 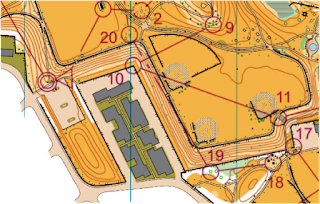 Shortly after was the final race of the CSU Park Series, a forest sprint on the same map. There was a lot of quick route choices, mostly whether to stay on the trails or cut through the woods. On Friday, we spent the morning at Magazine Beach in Cambridge for some great training. The first training focused on precision map reading that involved touching 3-5 different features during the leg depending on how long the leg was. This was a great way to start off the camp (for me anyways, I arrived that morning from a long drive down from Ontario) because it required lots of focus. It was tricky to plan your route since you had to think about not only getting to the checkpoint, but also where you were going to find different features without going too far out of the way. The second training was a little, or maybe a lot, more complex. The goal of this was to work on micro control punching. From what I understood, which wasn’t a lot, (I arrived halfway into the instructions…) there was a maze-like shape set up on the ground with many junctions and flags hung about. 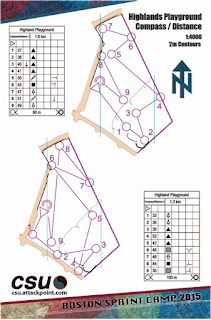 There were three levels of maps that showed a course with many trails and crossings. What you had to do was imagine you were running on the trail while actually on the maze, and turn at every maze junction based on the course of your map to find the right checkpoint. (Have I lost anyone yet?) I didn’t get very far in this, but from the little I did, it was very good brain training in terms of visualization, map orienting and quick decisions. Our third training was a street-o that focused on left or right route choice. This was quite fun because you got to test out different routes with others who were near you. We also got to help out some students that Barb Bryant coaches from the nearby elementary school try out a maze-O. They were all super keen about the sport and all seemed to do very well! Great to see so many kids smiling and having fun when they finished the course! That evening was the second race (1st one for me) at Danehy Park, a typical park-like terrain with one large hill and some tricky fences. This was a good race for me, I felt like I was able to keep a good flow with lots of reading, planning and looking ahead which is essential in a sprint race. There was some debatable route choice from 19-20, both of which I have decided were equally out of the way. Today’s training was all at Franklin Park, an open forest with a good trail network, lots of rock features, and some neat ruins. It started off with O-tervals, three to four controls at a hard pace with one control recovery in groups of three. This worked simulating a sprint race where decisions had to be made quickly in order to keep up with the running speed. Next was a farsta (one-person relay) which had three courses, all similar but with forking. There was a mass-start (which are always a metric-tonne of fun) and everyone went off, but since there were so many people running around, it was tough to stay focused and decide when to follow and when not to. The last morning exercise was practicing starts. There were seven maps with a start triangle, two controls, and a marked route to the next start. The idea was that when you flipped to the next map, you had to orient and locate the triangle with no knowledge of the course just like in an actual race. We all returned to the download area and ate some sandwiches that had way too much parsley, then some of us decided to go to a zoo that was nearby. 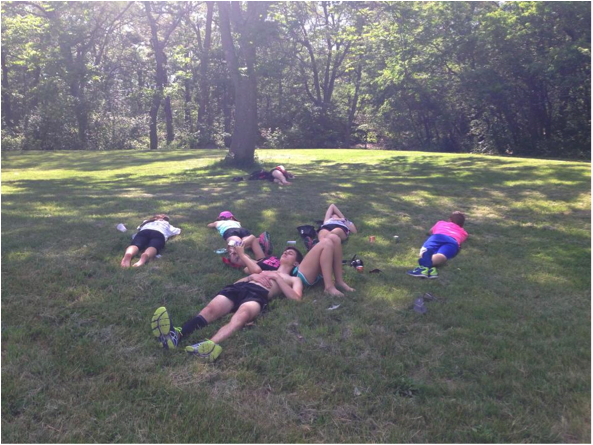 Lots of neat animals and creepy crawlies, but it was stinking hot so we headed back and took a quick nap in the shade. Later in the afternoon we had the usual race, another forest sprint. It was interesting because I’ve only ever done urban sprints so this really opened my eyes to a whole new type of sprinting. 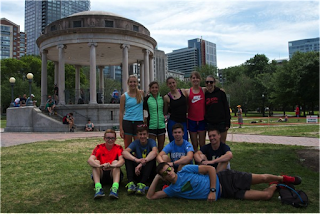 Sunday was jam-packed with action down at Boston Common for the sprint qualifiers and finals. The area was a large park with lots of crossing paths, tons of individually marked trees, and definitely no shortage on people. (Even some with guns! Don’t worry, us juniors took em’ down… or rather called the cops over who had arrested another guy not even 20 minutes before!) Each race had lots of direction change and a surprising amount of route choice. It was easy to get blown off course just from the amount of people, a good preparation for Europe! For me, the races went very well. I had a shaky start just trying to get the directions right, but once I got into the map, it was easy to look ahead at areas that would be crossed again at some point to get a general idea about where the checkpoint would be. Because the area was open enough to see the flag from a while away, map re-folding was key to get the change in direction right. The final went equally well with lots of cheering, spectating and yummy treats to be won! Thanks to all who organized this great event, can’t wait to race it again next year! 2015 High Performance Program Silent Auction at the Canadian Orienteering Championships! While the Canadian Orienteering Championships (COCs) are still two months, we wanted to let everyone know that the High Performance Program Silent Auction will be held in conjunction with the banquet on Sunday, August 16. If you have any questions, please email Emily Ross at hppsilentauction@gmail.com. Feel free to let her know if you are planning on bringing something so we can start to get a sense of what items will be donated as well as start hyping some of the big ticket items. Thank you for all of your support of the High Performance Program and we look forward to seeing you in the Maritimes! Yesterday was the long and first race of this year's World Cups being held in Norway-Sweden! It looked like it was a pretty exciting and gruelling day of racing. We had three Canadians running: Emily Kemp, Lousie Oram and Michael Svoboda. Is the link to the full results. There are also links to the GPS tracks worn by some of the athletes. 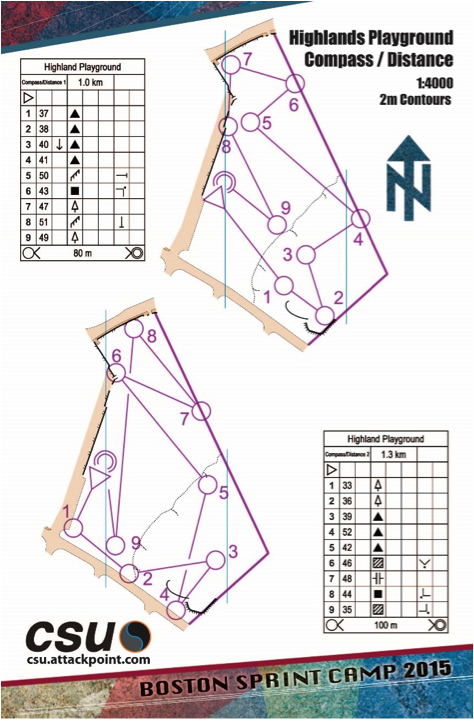 They are always fun to watch and a great way to do some 'arm chair' orienteering and practice route choice. See how your choices compare to the world's best! Stay tuned as there are three more World Cup races this weekend!